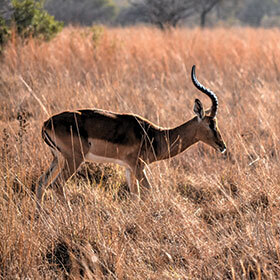 Controlling access at their Northern Cape game farm was critical to the owners to ensure that the livestock was unable to escape when the gates are opened to allow vehicles in. The solution involved installing two gates, integrated with existing CCTV cameras. Visitors enter the first gate and wait in a 30-metre-long safe zone, until the first gate is closed. They then wait for the second gate to open and enter the farm premises. The same procedure is followed when visitors exit the farm. Challenges faced included the long distance of 3 km from the gate to the main compound and the need to control access from a remote location via smartphones. 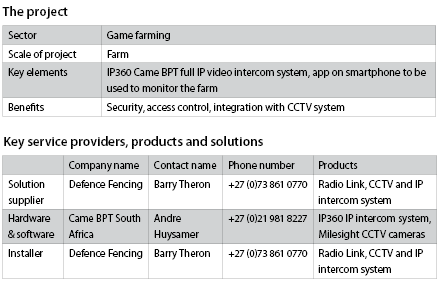 A solution was recommended by the system integrator, Defence Fencing, in consultation with Came BPT South Africa. The system allows the end users to see who is calling, provide them with access into the safe zone, as well as check that the animals are not escaping and that the visitors are safe. The system comprises two IP entry panels, a nano station radio link that tackles the distance issue between the gate and the main farm house, two Came slide automation motors, one Futura IP monitor, and two Milesight IP cameras with motorised lenses. A phone app for the IP intercom and the camera is provided on three dedicated smart phones. Illustrating how the use of technology and the knowledge of a good team is critical to the success of any project, the set-up of the system was undertaken remotely using a TeamViewer connection from Cape Town to Sutherland. This eliminated the need for a Came technical support technician to be present on site during the integration portion of the contract. The solution has been praised by the game farm owners, who are now able to monitor all visitors at the farm and ensure that their game is secured within the boundaries of the facilities.